As you all know last week I attended the Haven conference, a blogging conference catered specifically to DIY and home decor nerds bloggers, in Atlanta. 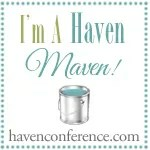 This was my first time at Haven for that matter any blogging conference. The experience was mostly invigorating at times ethereal, challenging, and even daunting. True to my word of the year, Overcome, I pushed through the event battling my introvert demons, my DIY fears, and just plain old awkwardness. You know, deep down I’ve always been an introvert but from the day I met my uber social hubby, B his social skills started slowly but steadily rubbing off. As a result throughout the years I’ve taken conscious efforts to resolve my awkwardness and trust issues (another Aquarian thing) at every possible opportunity. Haven was no different; I decided that there is no way I’m not going and booked my tickets the first day they went on sale, got myself a roomie (B was totally taken by surprise with this), braved the crowds and actually socialized with folks even made many new friends, and mustered enough courage to try using the jigsaw and wet saw (big big deal). There were times the ugly awkwardness and introvertedness reared its head like when I had the chance to use the miter saw ( I chicken out) and the dance floor (stayed a mile away) but I kept those to a minimum. Maybe next time……….. Yes I did take a lot of classes on blogging, photography, furniture building (so psyched about that), staining, tiling etc. but if you ask me what was Haven about I’d say it is the people. All those folks you know (through the internet) but you don’t know. Let me tell ya, if you ever come across a DIY/ Home Decor blogger in real life then strike up a conversation and be friends. These 350 or so ladies (mostly, there were just a handful of men) are the sweetest most warmest people I’ve ever met. More………I told ya I made so many friends! Oh almost forgot Celebrities – The opening session with HGTV’s Elbow Room host Chip Wade and a class with another HGTV veteran Mike Holmes (couldn’t make it to his session 🙁 ). Here’s me trying the jigsaw in the Furniture Building Basics class. Thank you Kelly for the pic. I’m seriously pumped up to use my Ryobi tools that I won at the Philly home show. From the staining class with the Shanty 2 Chic sisters. For 2 yrs I was blogging on a island and didn’t attend any conferences and can now attest to the need for going to such an event. A big shout out to the organizers, sponsors, speakers, and my fellow bloggers for making this newbie feel at home. It truly was a Haven! Ooooo…and the swag, I came back home with an extra bag full of it. Can’t wait to try out the products. May sound like a cliche but my blogging world has changed forever and I now have a new found appreciation and gratitude to be part of such an amazing group of talented and strong women. And of course all the new friends you make is the icing on the cake. Have you been to a blog conference? How was it? PS: I’m over at Remodelaholic today, where I’m a contributor, sharing my Jewelry Organizer project. Glad to hear you had such a good time! Haven is on my 2015 list for sure 🙂 Some of those bloggers that you met are my role models as well. I can hardly wait for my first trip to Haven!! Thanks for sharing. Thanks Aj. Means a lot. Me too, great to finally meet! I’m excited by your report back to us and I don’t eve blog!! I’m just an addicted reader who likes to try out all your great ideas. Mike Holmes? He’s a ‘local’ for me and I always hear stories from acquaintances starting with, “You know that house on my street that had all those problems I that I was telling you about…” Yes, he does seem to know how to fix things. He certainly gone a long since taking over his dad’s business. I can’t wait to see what new projects Haven has inspired in that head of yours! Don’t keep us waiting too long!!! Aww….that is very sweet of you Jan. Oh yes, Haven has opened up a whole new world of Furniture building to me. Can’t wait to get my hands dirty. I am so glad that we met in real life!!! It was so much fun hanging out with you. You didn’t seem shy at all! Of course I am not shy at all! LOL! Me too and oh yeah you and shy doesn’t even fit in the same sentence. 🙂 Love ya! I’m glad we got at least one photo together! It was great flying together! So very true Jena. We kept running into each other in between classes and that was it. Strange. How was your flight back home? The flight was good, but they lost my luggage 🙁 Thankfully they got it to me a couple days later. Haven is such a whirlwind, isn’t it? I wish it could be a day or two longer so we’d have more time to socialize! Ahh thanks for the updates. Really wish I could have gone. Aiming for next year, will you be there? Hope to be there. Will see. I’m so excited I got to meet you Vidya! Your recap summed it up perfectly! I can’t wait for 2015! It was so nice to meet you! I think many of us had our doubts and fears. I truly understand the “blogging on an island” comment, as well! I am glad I was able to meet you and other bloggers at Haven! Loved your photos!! So great meeting you Vidya!! I am so glad we got to chat and have dinner that night! Looking forward to next year! I was so happy to get to meet you, Vidya! I shied away from the DIY sessions, so that’s on my agenda for next year. Great recap.